I thank you very much for inviting me here today. I want to thank the sponsors of this conference for giving me the opportunity to share some of the information from experts in this field and some information that I have gathered from my own work about children who are violent to animals and individuals who are violent to children and the many, many kinds of manifestations that occur in linking those two types of activities. I'm going to put one slide up right at the beginning. I would like to leave you today with the following generalizations. Acknowledging problems in definition, cruelty to animals in childhood and adolescence is probably more common than we imagine. Secondly, in some cases, cruelty to animals in children may represent a significant symptom of psychological disturbance. Third, we must understand that cruelty to animals may be related to physical and sexual abuse, as well as violent family and community environments. And finally, successful interventions for young people who display cruelty toward animals will be based on a better understanding of the varied motivations for such behavior. Cruelty to animals is imbedded in broader issues of psychological health and disturbance. Now since I've given you the conclusion, I can leave. I thank you for your attention. I just wanted to make sure we would cover those points. You have in your handout materials an outline of the major points that I will try to touch on this morning. I probably won't get to all of them, but you do have them on the handout and there are references there. My address is there and I would be very happy to communicate with anyone who would like more information. There is also available a longer paper at this conference which describes in much more detail the research that has been done on the issue linking child abuse and animal abuse. At the beginning, you will notice that I have talked about hurting children. And I want to speak about hurting children in two senses. Yes, we do want to talk about children who have been wounded in some way. They have been wounded by a family member, they have been wounded in their community, they may have been wounded by a very, very close acquaintance of theirs. But I also want to talk about children who wound others. And that is the kind of connection that I will try to make today. That it is very important to look at hurting children, children who hurt others, but also children who have been hurt themselves. And that's why that connection may exist for many of them. It is with some discomfort that I present this first slide to you and it is with some discomfort that I come to you as an American to speak to all of you about violence because as you know, our society is a very, very violent one. And in many, many ways, especially with youthful offenders, the level of violence continues to increase. What sense can we make of ways to prevent and intervene, to reduce the levels of violence in our culture. Well, some have talked about — I think I want to have you first focus on this picture. A young child in a Cambodian refugee camp who has found an animal and is attempting to care for it. The next slide shows two boys with their pet animals and these are images that I want you to keep in your mind, the next one as well, because as we talk about the issue of violence to children and animals, I do not want us to forget, for many, many children, animals and them mean kindness, mean caring, mean nurturance, mean very positive things, and fortunately it is a minority of children who display inappropriate and cruel behavior toward animals. So let's keep these images in our mind and remember that children and animals usually represent a very, very positive relationship. The next slide is a drawing that illustrates that sometimes this relationship goes very, very wrong. We know about this from great writers — Edgar Allen Poe in his story, The Black Cat, talks about the relationship between violence toward an animal and violence toward human beings. Many, many examples in literature of this. But unfortunately, we don't have to go to fiction to see examples of this kind of association. The next slide is from the United States. I'm sure many of you are familiar with the case of Jeffrey Dahmer. Jeffrey Dahmer is an example of an individual who may not have engaged in actual acts of cruelty to animals, but he was preoccupied with the death of living things. And as you know, the things he did with dead animals, he later did with his human victims. So this was a very clear example where his childhood behavior should have alerted us to problems. Someone should have said this is serious enough to look at, to investigate, to think about. But, he is a rare case. Serial homicide perpetrators, again, fortunately, are rare in all of our cultures. But we are seeing something that is even more frightening, and now we are seeing children who are murderers. The next slide is an example of a boy who killed an animal. The newspaper headline reads "Puppy Dies When Boy Pours Hot Water On It." The next slide please. The newspaper headline reads "Ogden Family Moving After Pet Goat Is Killed By Rock Throwers." A family in Utah who moved away after their pet goat was stoned to death by some people in their neighborhood. Next slide. The newspaper headline reads "Cat Recovering From Arrow Shot Through Head." A case of a cat recovering from an arrow that was shot through its head. There is a tape that I will show tomorrow, and I will describe to you briefly now, of two young boys, and this tape and this incident is something that has prompted me to become even more concerned than I was before in looking at this issue. This was a case in Utah, in the U.S., where two young boys who were 16 years old would set traps for animals in a river nearby where they lived, and sometimes they would trap raccoons or other wild animals. In this case, they trapped a cat. It may have been someone's pet, or it may have been a cat like the stray cats that you see everywhere in our countries. When they found the cat, they began to make jokes about the cat being trapped, and they then took a bow and arrow and shot the animal, first in the face, and the animal did not die. Then they shot the animal with another arrow, and this arrow pierced the animal's body, but the animal still did not die. And one of the boys went over to the cat and while they were laughing and joking, proceeded to step on the animal's head many, many times until the animal was dead. Not only did they do this, but in addition, they brought with them a video camera so they could make a record of what they had done and show it to their friends and relive their excitement later on. Both of these boys were found out because the tape was placed in the hands of authorities. After a conviction, they were given a fine of $100. I think that's about 300 shekels. The fine was never paid. A year later, one of the boys was brought back again on charges of not paying the fine. I attended the court hearing where that young man was again put on trial. This time he brought his father with him. The magistrate of the court began by saying "We must view the videotape first." And the videotape showed this very, very horrible incident. And as the first arrow hit the animal, the father turned to his son and said "I thought you said you let that animal go?" The parent had never known what occurred. The parent did not realize what his son had done, and so it is unlikely that any kind of counseling or intervention, or even any understanding of the seriousness of his son's behavior was in the awareness of that father. This time, again, there was a $100 fine, which I think all of you will agree was a very insignificant punishment for that type of behavior. When I asked the magistrate if there would be any counseling for this young man, if he would be referred for any type of assistance, his response was "No, the people in Social Services, the people in Family Services are too busy to worry about a case involving an animal." And my concern is that if these boys were able to display such a serious level of callousness and lack of empathy, as Murry described, with an animal, with laughter, no concern at all, won't it be very easy for them to show no concern for a young child, who might be a victim of theirs at some time? I think that is the question that still haunts me about that particular case. Next slide, please. The newspaper headline reads "Ten-Year-Olds Charged In Toddler's Slaying." We know of cases where the level of violence is extreme with young children. We are all familiar with the case in England of the two ten year old boys who were recently convicted of killing a four year old. There is some evidence that there was animal cruelty in the backgrounds of these children. We know that there is a lot of distress in the family backgrounds of these two children who were convicted. Next slide please. The newspaper headline reads "Grief Over a Dead Child, And Over the Child Accused." In the U.S., there was a recent case of a thirteen year old boy who is alleged to have murdered a four year old child. Some of the evidence we have of this young man is that a year or two before this case, he had strangled his neighbor's cat with a hose clamp, and no one paid any attention to that incident. No one referred that child for any kind of attention. And here, again, one of the purposes of presenting this information is to heighten our awareness that we do need to attend to these cases. Next slide please. The slide is a cartoon of a psychiatrist writing on a pad while a patient lies on the couch. Diagnosis in psychology and psychiatry sometimes is very good, but sometimes it is difficult to do. For those of you who cannot read what the psychiatrist has written here, he has written "Just Plain Crazy" and that, sometimes, is the level of diagnosis. The next slide shows the cover of the American Psychiatric Association Manual of Psychiatric Disorders. We do know that one disorder called "conduct disorder" is very specific in its signs. It involves cruelty to animals as well as cruelty to people. It involves setting fires. It involves assaulting other individuals, forcing individuals to engage in sexual behavior — a variety of very specific behaviors. And as Murry mentioned, as of 1987, in that list of symptoms, we do now have cruelty to animals specifically mentioned, and because of that, we are beginning to gather more evidence about the prevalence of that particular characteristic in children who are coming to a variety of clinics for assistance. Conduct disorder is often related to difficulties in families, very serious difficulties in families, in terms of discipline that is inappropriate, child rearing practices that are inappropriate, that may use a lot of violence and coerciveness, and also an absence of monitoring what children are doing, where they are, who they are with. And that is a very big problem in many of our cities as well as other communities in the U.S., and I'm sure that may also be a problem here. Next slide, please. The newspaper headline reads "Humboldt children face animal cruelty and burglary charges." This is just an example of some children in the U.S. who displayed a number of symptoms of conduct disorder, including stealing things, being violent toward other children and being violent toward animals, and it is not an uncommon diagnosis for this to occur. Next slide, please. Given that we have all this information about cases where children are cruel, I would like to spend a few minutes now talking about some of the environments, some of the contexts that seem to be associated with this type of behavior. One of them, and this is in the general area of family and community violence, one of these is for children who are accompanying their mothers to shelters for battered women. In the next slide, you see the face of a child who has come to one of these shelters, and in the U.S., as I'm sure it is here, it is very common for children to accompany their Moms to these shelters. They are often as stressed as the mother is, in some cases relieved to have left the environment they were in. In fact, there have been some cases where it wasn't until the husband or boyfriend or stepfather killed the pet animal that the mother finally decided "Now I must leave." And so there is an association there that we need to be very, very attentive to. These children in the next slide, as some of you who work in this area know, are very vigilant, they are hypervigilant in terms of looking at their surroundings and being very concerned about what is happening around them. And in the next slide, you see one of the very negative effects for these children. This young boy has armed himself with a rubber knife and a plastic gun and his comment to the photographer was "If Daddy ever comes home, I will kill him and keep him from hurting my Mom." And again, we have an example of a young child who has already adopted a violent strategy for solving problems, and he has also been placed in a role of protecting his mother, which a nine or ten year old child should not have to be in. And so here, again, we have examples of that association. There are examples where siblings have abused their brother or sister's pet to intimidate and frighten them, in some cases killing the animal. And we know that in the area of child physical abuse, it is not uncommon for animals, if they are present in a home, to be abused as well. And as Murry has said, sometimes, and there are a number of cases where this occurs in the U.S., an animal welfare or animal control officer will come to a home to investigate a report of an animal having been neglected or an animal being maltreated, and that officer will find a child who is in danger, and will report that to Social Services. And it's an example where we need to again heighten our sensitivity to be looking for this association; even though it won't always be there, we must be more sensitized to its potential presence. The next slide is an example of a child from a shelter. He has drawn himself hiding behind a couch. His mother is in tears. And his stepfather is about to step on the child's pet bird. And this is the same man who at an earlier time had suggested to his wife that she kill her infant because it was making too much noise when it was crying. In the next slide, you see another drawing of a child whose stepfather has kicked the child's pet dog down a flight of stairs. Again, these are examples of the kinds of environments that many children who are in shelters for battered women may have experienced in their homes before coming to a place of safety. And we are only beginning to learn what the long-term effects of exposure to this kind of violence is on these children in the future. 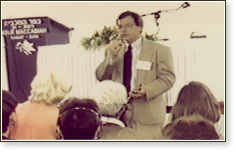 The next slide is taken from a book which Dr. Barbara Boat contributed to, and you will hear more from her about one of the cases in this book, but Dr. Bill Friedrich has done a very large study of sexually abused children, with a number of collaborators. And this is the only graph I will show you. I decided that I will not bore you with many, many figures. I do have lots of data and graphs and statistics that I can show you, but let me just show you one that I hope will stay in your mind. In this particular slide, the comparison is between boys, who are shown in blue, and girls, who are shown in yellow, and some of the children in this figure were sexually abused, and these are cases where there was an investigation, and the social worker or Social Services or Police, whatever investigating agency it was, determined that yes, there was cause for a charge to be filed, and this child should be in some kind of protective circumstance. The data in the slide are the percentage of children who were reported by their mothers to have engaged in cruelty to animals in the past six months. And as you can see, for the boys on the left who were sexually abused, the percentage is nearly thirty-five percent of those victims, and these are victims between two and twelve years of age, and for the girls, the percentage is twenty-eight percent, roughly. And those percentages are very much higher than the low percentages, which are for non-abused children. Even those we might say are too high. Those should be lower. We shouldn't have any children engaged in cruelty, but in a sample of children, we might find between three to five percent of them who are also engaging in cruelty to animals, but may not have been abused. And so this is very clear evidence just from one, but a very large study, indicating that this association may be very, very strong in some cases. By the way, I should mention to you that the abuse of animals that some of these children engage in may involve physical cruelty, but it also may involve sexual acting out with animals, and in some cases, children have been reported to engage in sexual behavior with animals, and the animal may die during the process of that activity. And this is another area that I think we need to become more aware of, where young people may be associating sexuality with violence and death, and all I can imagine is the long-term effects of that in their relationships with other human beings. That is another dangerous area that I think we need to be much more attentive to than we have. It is not easy to talk about, but I think it is something that we must be sensitized to. Next slide, please. Animals may play a positive role for some child victims, and again, I don't want us to forget that throughout our discussions of cruelty. In this particular case, this is taken from a book written by a prosecutor in New York City who works with child abuse victims. This particular prosecutor has talked about how, in some of the cases she has worked with, she has found that having an animal present while a child is being interviewed may give that child the confidence to talk about their abuse. It may calm them. And in this particular case, this was an example of a dog that she had brought into the Police Department, and the child said "If we can bring this animal to the courtroom, and if he will sit next to me, I will tell what my perpetrator did. I will tell what he did to me, how he hurt me. But if the dog is not there, I will be frightened." And so animals, for some of these abused children, may also play a comforting role, one that allows them to cope with the violence that they have experienced themselves. Next slide, please. I do not have to tell you about the effects of war and community violence on children. Many of the contributors to this particular book (The Psychological Effects Of War and Violence On Children) about the effects of violent circumstances on children are from your own country and have contributed to the studies in this area. We know that this can affect children in a negative way. In the next slide, we see some children who are from a Cambodian refugee camp. Some of these children are remarkably resilient, given the circumstances that they have grown up in. The next slide is an example of that. They can still be gentle and nurturing with one another. But unfortunately, the next slide shows that some of these children who are hurting, who are wounded psychologically, also begin to wound others, and that is another circumstance that we need to be attentive to. The U.S. and some of the cities in the U.S., I know you have heard, have been described as war zones as well, because the violence there is a chronic, ever-present part of the communities for some children. We must be attentive to children in these circumstances. Next slide, please. I will end with three mechanisms by which children may develop cruelty. One is by watching what is around them, by the models that they see. These are sometimes adult models of violence. Modeling, as we see in the next slide, can also be very positive, where children will learn nurturance from adults around them. The next slide is an example where children are learning violence toward animals. And this is a case where a raccoon, a small animal, is placed into a barrel. And this is being done at a picnic, a family gathering. The game here is for the dog to be used to rip the raccoon out of the barrel. The raccoon is repeatedly taken out of the barrel until it is dead and then another raccoon is replaced. What I want you to look at, in the next slide, are the faces of the children who are watching. These children have learned a lesson. They have been taught a very, very wrong lesson about how animals should be treated. The second area is in the development of empathy, and this, I know, in the next slide, will be discussed quite extensively. We will talk more about the developing of caring children tomorrow, as well. Children need to learn how to be sensitive to each other's feelings, and many at this conference will describe for you how caring for animals may be a vehicle, may be a mechanism by which that caring can be instilled. Next slide. And that also means caring about emotions that are difficult, being able to console one who is crying, someone who is in tears. We also know, as a third mechanism, that children who are exposed to trauma of many kinds, both man-made, human-made trauma, and natural traumas — hurricanes, other natural disasters, earthquakes — we may see cruelty to animals in those children as well, as a manifestation of their disturbance. The next couple of slides are toward the end. Children are remarkably resilient in some cases. We know that some children are able to cope with the problems that they are confronted with. We're not sure of all of the factors that are involved, but we do need to learn how some children are able to take their own violent experiences and turn them into very positive behaviors toward other people. What I want to leave you with today is this message. Next slide. We as parents, we as adults, we as teachers, we are tested, and sometimes when children are involved, we fail our children. Sometimes we fail our children individually, as parents, as a friend, as a peer, but sometimes we fail our children collectively, as a society. Sometimes we fail them as a whole culture. If we do not hear those cries, if we do not listen to those cries, then the child that says "I hurt," that phrase may become a prophecy. Thank you. Thank you Dr. Ascione. We will now take questions from people who will line up at that microphone. One of your things on sexually abused children, where charges were filed, I wasn't sure about the 30% boys, 28% girls were engaged in animal abuse, was that after their own abuse or before their own abuse? Very good question, and unfortunately, the way that it was measured in that particular study, and the way it is usually measured, it's impossible to tease out whether this behavior preceded the abuse, or whether the behavior was a result of the abuse, or whether they were contemporaneous. The unfortunate thing about many abused, and as you know with many sexually abused children is that this may not be a single, isolated event. This may have been a part of the fabric of their lives for months, or in some cases, years. Obviously, with the younger children it wouldn't be that long, but one of the questions you are raising is the very important one that we need to be more specific about the kind of information we have in this area, in terms of timing of the activity, and severity of the activity. Those are questions that are usually not addressed in many of the studies that are done. We're only beginning to do that. My problem in this case is that my own experience, which is a little bit limited, but my own experience from my youth, in my Air Force days, from my growing up, and my adult life, has always been — mind you, I haven't seen the other side, I must admit — but the one side that I've always seen is that many people that have been particularly kind to animals and hurt when they're hurt have, in fact, been violent people to adults. Now not only has this been my experience, it's also been my own case. I'm inclined to be extremely gentle with animals. I don't like to see them hurt, and I'll help them, and yet I won't hesitate to hit somebody that's cruel to an animal. So it seems to me, although my own experience is limited, it seems to be completely opposite from what's been going on here today. Do you understand? Yes, I think the question you raise is about the consistency of some of these relationships. I had one other slide that I wasn't going to use that relates very specifically to your question. I think we have to look at all of the possible cases. There are some individuals who are violent wife batterers and who, for some reasons, are very protective of their own pet dog. There are some individuals who may be very, very concerned with the number of pets that they are caring for, but are very insensitive to the human beings that they may interact with. We know of individuals who are cruel to both human beings and animals, and we know individuals who are kind to both human beings and to animals. And trying to explain how this compartmentalization occurrs, I think is one of the challenges that we face. I think our ideal is for humaneness to be general, for caring and nurturance to be general, but I know that, when I examine my own life, that that is not the case. I know that there are differences in the way I treat, even within human beings, different people. So yes, you raise a very important concern about the issue of generality, the issue of consistency. Thank you. I wish you would have devoted some time to the relationship between cruelty and poverty, and that this kind of cruelty is not always evil-spirited. Sometimes it is an impetus that was raised by poverty. Yes, I think that your point is very important because poverty for all is a stress, is a severe stress, and we know that the more factors of risk that we add to a child's life, to a family's life, the greater the likelihood that we will see serious difficulties in coping for that child. I think it was Maslow who talked about a hierarchy of needs, and if the very basic needs are not met — if children are not fed, if children are not safe, then it is very difficult to go beyond that to caring and nurturing even oneself, much less being caring and nurturing toward others. So your point again is very, very important. We must look at the very roots of these problems. We must also be attacking those roots and to alleviate things like poverty which are so stressful in the lives of children. Thank you. I've been interested to know how you categorize cultures that have sport hunting, bullfighting, how that fits into your categorization. I didn't want to answer that question. And it's a very important question. I don't mean to make light of it by my initial comment. I think my initial comment reflects my own unease about how we deal with those issues. I think that we as cultures have to keep examining and reexamining all of our relationships with animals as they might reflect our relationships with each other and with our natural world. The incident you saw of the animal being pulled from the barrel by a dog is, for that community, a sport. We look on that with horror. Someone else might not. They might look on that as a not very serious example of animal cruelty. We have different views of different animals and what it is acceptable to do to them. And so there, there are many, many differences. I tried to develop a definition of cruelty to animals, and you have that definition on the handout that you received this morning at the very top, but in some ways, it is more difficult to define cruelty to animals, because we have to consider the species issue. We have such different ways of behaving toward different animals in each of our cultures. It is my belief that children are going to learn whether life is valued or whether it is devalued by the way animals may be treated in sports activities. And I know that we have to be sensitive to cultural variations. But I think we also have to be confident enough, in some cases, to say: "No human being should allow this to happen, regardless of their culture, regardless of what the tradition was, this should not happen. And it should not happen for one reason, because this is a lesson that our children should not learn. This is a lesson they should not learn." You spoke about children imitating their environment. Has the influence of TV on children's violent behavior been measured? The question about the influence of television is something that, again, the United States has recently become concerned with again, because as you are aware, there is a great deal of violence that is available on regular programming, and then there is also the new medium of videotapes, which many children will sometimes get access to, even though their parents are not aware of what they are watching. I have been told by some who work in the area of child sexual abuse, where children may be describing incidents of abusive activities, of sexual activities, that may have been on a videotape that the parents may have let sit on a counter in the home and the child has gotten access to it, and that is a medium that I think we need to be very, very concerned about. In the U.S. right now, there is a movement to label television shows and label videotapes and label video games — the Nintendo and Sega and other games — with warnings about the violent content of these games. And in one of these games, it shows a man decapitating a woman with the sound track saying "Finish her off, finish her off." And children are seeing this repeatedly. I think that we know that in that research area, and this is research that has been done since I was a graduate student in the 1960's, early 1970's. There is research showing that there is a strong association, especially for children who already may be at risk in some way, who may have some predisposition toward violent behavior, this may be one other factor that increases the likelihood that they will become even more violent. The incident of the two young boys in England who killed Jamie Bolger, the little toddler: there is some evidence emerging now that one of the murderers watched a videotape of a movie called "Child's Play Three" very soon before that murder occurred, and some things were done to the victim that were very similar to what happened in that film. So yes, we must be concerned about that, if only for the message we are telling our children by allowing this to occur with such intensity and such frequency, given everything else that they could possibly be watching. Frank Ascione, PhD, is a professor at the University of Denver's Graduate School of Social Work and the Executive Director of the University of Denver's Institute for Human-Animal Connection. At the time of this conference, Dr. Ascione was a professor in the Department of Psychology and adjunct professor of Family and Human Development at Utah State University. Dr. Ascione has published a number of articles on the development of antisocial behavior in children and has coedited two books, Cruelty to Animals and Interpersonal Violence: Readings in Research and Application (1998) and Child Abuse, Domestic Violence, and Animal Abuse: Linking the Circles of Compassion for Prevention and Intervention (1998). He is the author of Safe Havens for Pets: Guidelines for Programs Sheltering Pets for Women who are Battered (2000) and of Children and animals: Exploring the roots of kindness and cruelty (2005). He is the editor of The international handbook of animal abuse and cruelty: Theory, research, and application (2008). Dr. Ascione was selected to receive the 2001 Distinguished Scholar Award from the International Association of Human-Animal Interaction Organizations and the International Society for Anthrozoology.